On Africa's east coast, Kenya straddles the equator and shares a border with Somalia, Ethiopia, Sudan, Uganda and Tanzania. The Rift Valley and central highlands area form the backbone of the country. 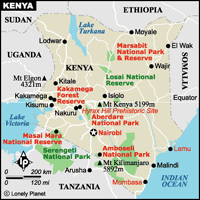 The vast, arid north-eastern region is where Kenya is at its wildest and most untouched by the modern world. The vast plains of the south are dotted with flat-topped acacia trees, thorn bushes and the distinctive bottle-shaped baobab tree. On the rarified slopes of Mt Elgon and Mt Kenya, bamboo forests sprout and even higher up is the bizarre groundsel tree, with its huge cabbage-like flowers, and giant lobelias with long spikes. Mark Olson says: Northern and eastern Kenya, southeastern Ethiopia, and Somalia are remarkable for being so vast an expanse of dry habitat so close to the equator. For the most part, the following pages have photos from dry parts of Kenya, many from the greatly underexplored districts of Mandera and Wajir, last visited by botanists more than 20 years ago.